Here, the area between the market and the station has been extended and consolidated, bringing coherence to what was once a cluttered part of Hengelo. Various new city blocks, including apartment complexes, a department store and a shopping arcade get individual architectural treatment, each locking in its own way into the surrounding built fabric. Together they mark out a new ‘Brink’ (literally, village green) linked to the marketplace (Marktplein). 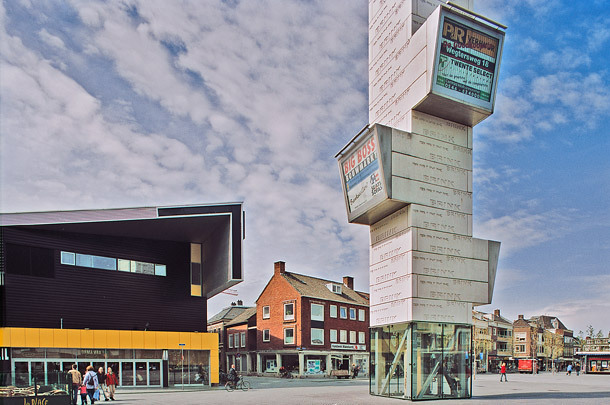 At the hub of the spatial composition is a ‘campanile’ in three parts, a glass cube, a concrete stem and a digital clock. The shopping arcade accompanies the route to the station forecourt (Stationsplein).